The Hitman beta for pre-orderers is still a way off for PC players (February 19), but a new trailer has appeared that starts to answers some questions surrounding Agent 47's new incarnation. The beta, rather than being labelled a 'stress test' or the like, is being billed as 'the beginning'. It's set 20 years in the past at a top secret facility, and will detail how Agent 47 joined international murder conglomerate, the ICA. It's effectively a discrete episode within the series of Hitman chapters to be released. Naturally, it'll give Io the chance to test their online content like leaderboards and the implementation of new targets, and it'll also allow us to get a feel for 47's new groove without spoiling the one headline map Hitman will launch with. I should note that the introductory level will also be present when Hitman releases, so don't worry about missing out, although saves won't carry over. 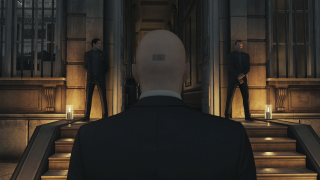 Hitman's first chapter may be more substantial than we thought.